We commonly vaccinate three species at Ashley Vets – dogs, cats, and rabbits. 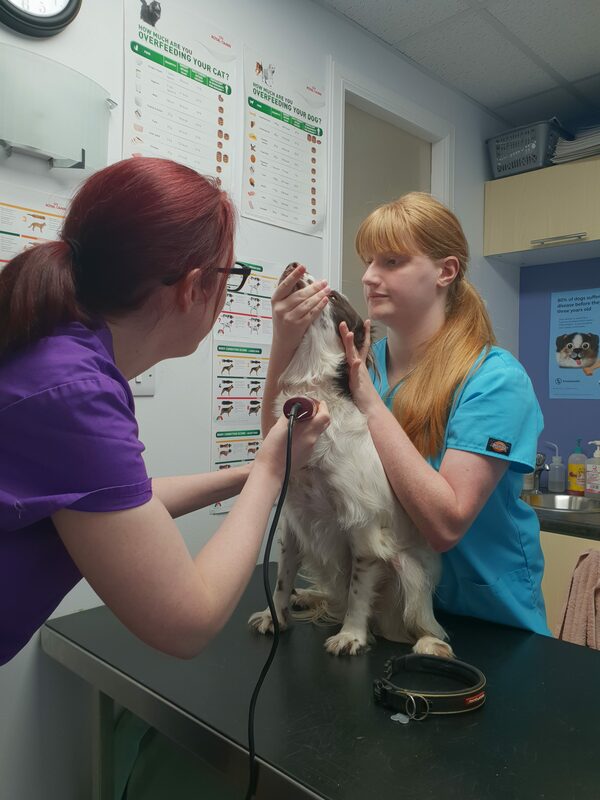 In the last few years, we’ve had increasing numbers of owners concerned about the effects that vaccination may have on their pets, particularly with regards to ‘over-vaccination’ and side effects, with some owners opting not to vaccinate their pet at all because of their concerns. Unfortunately, the diseases which we vaccinate against are serious and often fatal. It is thanks to widespread vaccination that we have seen a significant drop in these diseases over the past 30-40 years, and increasing numbers of owners, thankfully, having never come across them. There is no cure for the diseases we vaccinate against. In many cases, hospitalisation and intensive care for up to several weeks are all we can do, and this is not always successful depending on how serious the infection is. Vaccination not only protects your pet against these diseases, but thanks to an effect called ‘herd immunity’, it also protects every pet they interact with. Some pets are unable to ever be vaccinated due to a weakened immune system (such as pets undergoing cancer or intensive allergy treatments), and they depend on other pets being vaccinated for protection. For these reasons, we cannot recommend vaccination strongly enough. Vaccinations are life-saving, and considerably cheaper than the intensive care required to treat the diseases we prevent. Many insurance policies also insist on pets being vaccinated, and may be invalidated in certain cases if not. However, we do understand some of the concerns surrounding vaccination. Some pets do have adverse reactions to vaccines which are very similar to adverse reactions in humans. The more common reactions are a swelling at the injection site, a mild fever, or lethargy and/or a reduced appetite. These are all generally self-limiting and do not require treatment. Very rarely (defined as less than 1 animal in 10,000 or isolated reports), pets can suffer from hypersensitivity or anaphylactic reactions. These would typically begin whilst the pet is still in the practice, so identification and treatment could begin very rapidly. There is no scientific evidence available of any other side effects, including behavioural effects. The presence of these side effects is why the WSAVA (World Small Animal Veterinary Association) has published guidelines on the safe and effective use of vaccines. We do strive to follow these guidelines where possible. WSAVA has defined several ‘core vaccines’ for dogs and cats, which should be administered regardless of lifestyle to all pets who do not have an existing health problem which does not respond well to vaccination. In dogs, these are distemper, adenovirus/canine infectious hepatitis, and parvovirus. In cats, these are feline parvovirus/panleukopenia, calicivirus, and feline herpesvirus/rhinotracheitis. The recommendation is that pets receive these vaccines as puppies/kittens, then again at the first booster at 6 months to 1 year of age, then no more often than three-yearly. We follow this recommendation, except that we carry out the first booster at around 1 year of age, as it gives us the chance to give your pet a full health check as they mature. WSAVA have also defined ‘non-core’ vaccines for dogs and cats, which can be given based on local risk and the pet’s lifestyle. This includes leptospirosis in dogs, feline leukaemia virus (FeLV) in cats, and rabies in both species where the pet is not traveling outside of the UK. Leptospirosis and FeLV are present in Scotland and cases are seen across the central belt every so often. Leptospirosis is transmitted via the urine of infected dogs, and FeLV by contact with any body fluid. Therefore, we strongly recommend that any dog or cat who goes outdoors (including cats who ‘just’ go out into the garden or the veranda) or lives with other dogs or cats are vaccinated. Due to the way these viruses work, the WSAVA recommend that these vaccines are given annually unless risk factors change. Rabies is not currently required if the pet is not travelling outside of the UK. We do know that immunity against some diseases can persist for much longer than the recommended dosing schedule. We can test the levels of immunity against a virus with titre testing. Unfortunately, there are no reliable titre tests which exist for the majority of the diseases we vaccinate for in cats, but testing is reliable and effective for distemper, canine infectious hepatitis, and parvovirus in dogs. Titre testing involves taking a small blood sample and sending it to a lab, who then are able to determine the level of immunity present with a series of tests. A positive result means that there is no need to give the DHP vaccine again for at least 1 year. In cases of positive results, we would always recommend repeating the test every year so that we can be certain your pet has the required immunity. A negative result means that the pet does not have sufficient immunity to last a full year, and revaccination is recommended. Titre testing may not entirely replace vaccination for every owner due to the slightly higher costs involved, and the need to vaccinate against leptospirosis annually in many dogs regardless, but it is a very useful tool and is readily available to any owner who wishes it. However, we would recommend checking with your insurance company to make sure they accept titre testing in lieu of vaccination. Unfortunately, none of these guidelines apply to rabbits. However, both myxomatosis and rabbit/viral haemorrhagic disease are extremely infectious and commonly fatal, so we strongly recommend annual vaccination. If you have any further questions, please contact the practice or speak to a member of staff next time you’re in.